“Mom we have to help,” declared my oldest. He had seen some of the images on the television. He saw the devastation and the need. Like so many children his compassionate response was immediate. It wasn’t complicated in his mind. There was a need and we had the means to help. He did extra chores to earn money and made his own contribution to our donation. It was a wonderful experience for us both. I have been working with children for over 40 years. I have found that most children are naturally kind and generous. If they are invited to help others they will throw themselves wholeheartedly into the project. It is wonderful to see. It is also wonderful to watch the smiles and enthusiasm that accompany even the smallest act of kindness. Kids love this stuff! It feels really good to be able to help others and making it a family project has all kinds of benefits. One of the simplest ways to reach out is to make a Kiva loan. Who or what is Kiva? Kiva is a non-profit organization that allows people to lend money to people in developing countries. Kiva works with micro-finance institutions on five continents to provide loans to people without access to traditional banking systems. It literally changes people’ lives. To understand how Kiva works take a moment and watch their Video. The first thing you will need is $25. You could just take the money out of your bank account, but it is far more meaningful if you work together to raise the money. Brainstorm ways of raising $25. Why not ask your children for their ideas. You might surprised at their ingenuity! Ask each member of the family to contribute gently used items that can be sold. One night a week enjoy a low cost meal and put aside the money that you save. Make your own bread and put aside the money that you save. Ask each member of the family to give up one treat a week. Go on a loose change scavenger hunt. Check under sofa cushions, on top of bureaus, in pockets, in the laundry room. If you live where refundable deposits are charged on bottles go on a bottle hunt. Round up those empties and take them back to claim the deposit. Together choose one or more idea and put your plan into action. When you have raised your $25 it’s time to make the loan. 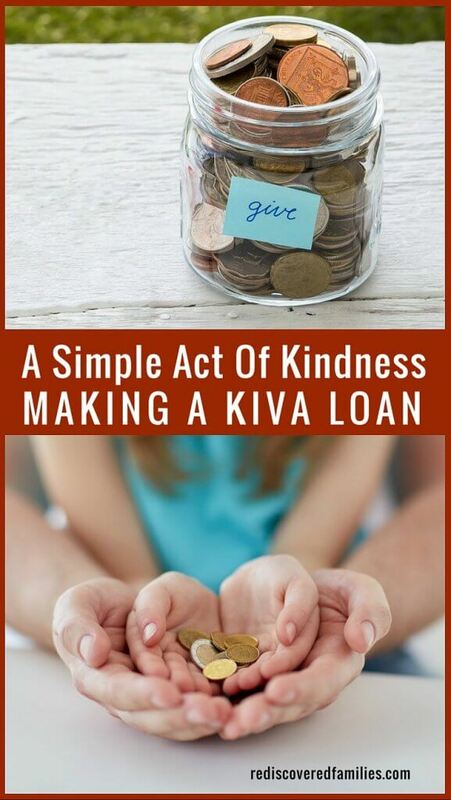 Making a Kiva loan is simple. Start by gathering together as a family. Explain that in some countries it is almost impossible for people to find work or get a loan to start a business. Go to the Kiva website and help the children to explore the site. Next open a Kiva account, choose a project to support, and then make your loan! You might like to print out the profile of the individual who is receiving the loan and post it somewhere that is visible to the whole family. When the loan is repaid (97% of them are) choose another project to support and repeat the process. It’s as simple as that. Have you ever made a micro-loan? Have you any creative fund raising ideas to share? This is a great idea, Sharon. Thank you for sharing the opportunity to make big differences from modest donations. The fact that you only have to give a little to make a huge difference is one of the things I really like about Kiva. I loved learning about Kiva! I always wondered how it works. And, you’re right, it’s so perfect as a family project. I’ve not heard of Kiva before. I look forward to learning more about them. Thank you! Thanks for stopping by Linda. Kiva is a great organization. This is such a thoughtful and selfless idea and one which I think I’ll start. I have never heard of Kiva in Australia but I’m sure I can figure a place to donate the money. I am involved with Rotary and donate to our club regularly, I thoroughly enjoy the fellowship but also the positive feeling that goes with giving my time and donating to our club projects. We’ve just raised enough money for a Shelterbox which is an amazing cause. 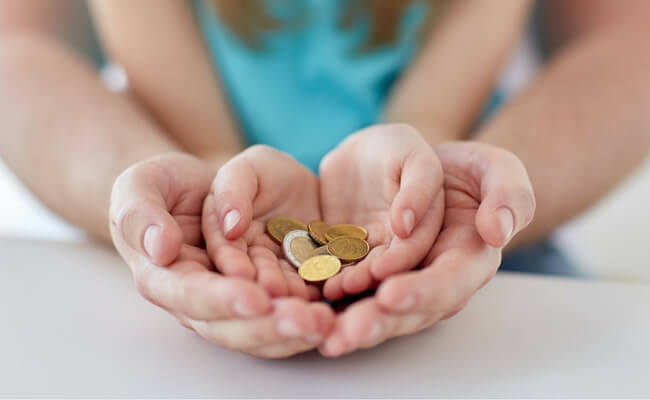 There are probably organizations in Australia that provide micro loans. Still in the end it doesn’t matter who you support, it’s the giving together that makes a difference. So glad that you shared this at Magic Moments Monday! A great activity and a fun cause to teach our kids to think of others. You are welcome. So glad you dropped by. Please come again!